Ready for some pillow talk – literally? 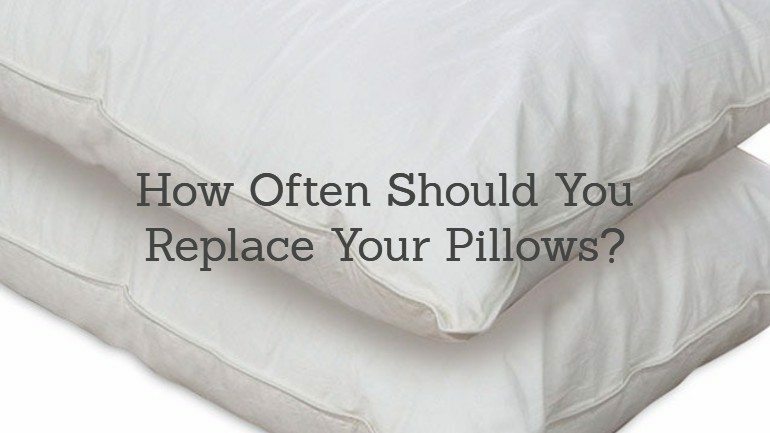 One common question we get is readers wondering how often to replace pillows. The answer definitely depends on a number of factors, including the quality of the pillow itself, how often you wash your sheets, and more. If you’re wondering how often should you change your pillows, keep reading to learn more. If you’re using a simple, inexpensive pillow, you should be replacing it every 6 months or so. Cheap pillows (usually made of polyester) wear out very quickly, loosing their shape and becoming lumpy. Since they are cheap, replacing them often is not a huge expense. If you’re using a nicer pillow, you should be replacing it every 18 to 36 months. Higher-end pillows, often made of memory foam or other more durable materials, have more structural integrity and therefore last a lot longer than run-of-the-mill cheap pillows. Why Do Pillows Need to Be Changed So Often? Comfort – you spend 6-9 hours a day, every day, using your pillow. The weight of your head and neck (which is about 10 pounds!) presses down on your pillow, causing it to change shape and become lumpy. Sure, you can re-fluff the pillow to adjust its shape, but after a while, it simply will not return to the comfort level it offered when you first got it. With higher end pillows, the damage is slowed, but still takes place. Keeping a pillow for too long can result in neck pain and other problems. Cleanliness – as it turns out, pillows can be havens for dust mites, allergens, bacteria, and more. In fact, after just 1 year of use, up to 15% of your pillows weight could be made up of dust mite poop. Yup, pretty gross. But beyond just being disgusting, these contaminants can contribute to allergies, acne, disease, and more. Replacing pillows often is highly recommended, both for health and comfort. Research has shown that most people do not know how often to replace pillows, and therefore tend to keep their pillows for far too long. But, now YOU know the truth, and can start making the proper changes to replace your pillows often. I Need a New Pillow! What are Some Good Options?